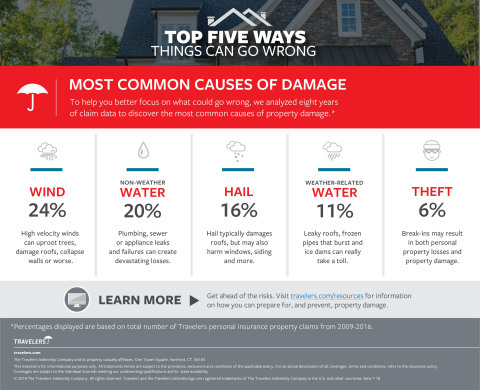 HARTFORD, Conn.--(BUSINESS WIRE)--The Travelers Companies, Inc. (NYSE: TRV) today announced it has released its Top Ways Things Can Go Wrong interactive report, which identifies the most common and costliest causes of home damage. The report examines the company’s national homeowners insurance claim data from 2009 to 2016. It highlights the types of claims that are most prevalent in four regions of the United States and some of the largest metropolitan areas. The report also breaks out claims by season. Weathering the Storm – Weather was a significant contributor to property losses throughout the year. Damage from windstorms, hail and water accounted for half of all claims. Water in the Home – While water damage caused by weather is certainly a risk, more water-related claims were due to non-weather events like plumbing or appliance issues inside the house. Risks by Season – Spring produced the highest number of claims, mostly related to damage caused by hail. Wind was the leading source of claims during the summer, fall and winter. Different Regions, Different Risks – Looking at the United States by region (Northeast, South, West and Midwest), the South recorded almost half of the total claims (46 percent), while the Midwest (12 percent) had the fewest. Wind was the largest contributor to claims in the Northeast and South, while non-weather-related water damage was the reason for most claims in the West. Hail was the most common cause of damage in the Midwest. Risks by City – Wind damage ranked in the top five for both most common and costliest claims in the metropolitan areas analyzed in the report. Fire was one of the costliest causes of claims in these cities, while theft was among the most common. Travelers recommends that homeowners perform regular home maintenance and periodically review their insurance with an independent agent. 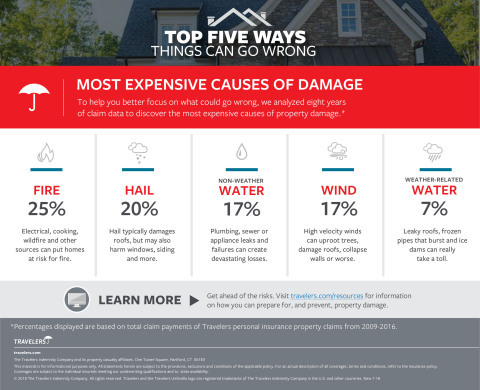 To access additional information on the most common and costliest homeowner claims and valuable tips to help avoid them, visit the Top Ways Things Can Go Wrong interactive report.